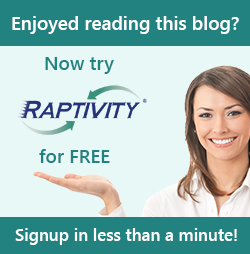 Raptivity - Rapid Interactivity Building Tool: mLearning – It Scares Me. Should It? So you’re not sure if you should enter the world of mLearning. Understandable. Let’s take a look at some quick ways for you to be successful. An oft-asked question from newcomers to mLearning is “What types of courses should I create?” This is a great question. My answer is generally it depends. Thanks Greg!!! I want a better answer you say. One more specific. The honest truth is that every organization should really go through a mobile learning strategy session similar to what I discussed in my four part blog “Moving to Mobile – What are the Gotchas”. Here are two topics you should answer before creating that first course. Answering these will help you succeed. One – what is the problem/requirement you are trying to correct? This is an important driver for your design. And two – what device(s) will you be supporting? Why is this so important? Most people build with a tool of some sort. Most of the tools do not output responsive design. Each tool, generally asks for the published size you want. There are things you can do well on a tablet that you may not necessarily be able to do well on a phone’s screen. Therefore, you really need to know. These are the types of courses I feel are the mostmobile friendly. A lot of these can be accomplished using an FAQ, search and display, or other knowledge transfer activities. A great tool is a flowchart with explanations, or an image with drill down explanation text. Mobile devices have fantastic multi-media capabilities. Use them. Be creative with your use of videos, audio and even geo-location (GPS) capabilities to find the correct instructions/procedure for something. Any organization with a learner base with access to mobile devices can benefit from mobile learning.Just because your learners are “office-bound” doesn’t mean they can’t benefit. Take for instance using a tablet to have a software simulation training running while you are working with that software on your desktop computer. I’ve done this. I used a version of a book displayed in iBooks while learning a new piece of software. I could take notes, highlight, and create bookmarks – just like I would a normal book. I could also create Flash Cards for to help remember specific tasks. It was very helpful. Raptivity has many interactions that output to HTML5. For Raptivity, only the interactions that output to HTML5 should be used for mobile learning. Flash output is not supported by most mobile devices. Here is a listing of the Raptivity interactions I think are the best candidates to be used in mobile learning. While there are other interactions with HTML5 output, these are my favorites. You should not be afraid of mLearning. If you look, I’m sure you can easily see the opportunities within your organization. The tools are available and will make you successful. Find the right content, “chunk” it into something small and specific, use the appropriate interaction for displaying that content and publish. I’m positive you’ll succeed.